I’ve received a couple of emails from people asking me if Daggerfall Imaging 2 can export to more than just GIF files. This isn’t the first time I’ve heard this question. Many seem to have missed the fact you could do this in Daggerfall Imaging 1.0. I think the reason for this is the old web-like interface. Users discover the right-click copy method and don’t notice the “Export” icon on the toolbar that allows you to export to a wide variety of formats. Considering this, I’ve decided to overhaul how you export files in Daggerfall Imaging 2. Rather than use a modal popup dialog, this is now tightly integrated into the main view via a sidebar that can be toggled open or closed. The screenshot below shows DF Imaging 2 in near-complete form. The left-hand pane shows thumbnails of image files by library (textures, img, cif, etc.). You can mark image files for export by putting a tick in the check box of any item. A right-click context menu allows you to check all, check none, or invert checked items. You can also set your own descriptions for each image file, which is stored in an XML database. The middle pane is the Image Explorer; a flow view for viewing images up close. You can toggle animation, transparency, and zoom in or out. The status bar tells you about the image you are hovering over. Another right-click context menu allows you to copy images to the clipboard. The right-hand pane is the Export Manager. This pane allows you to set an export format and destination, along with a few options. 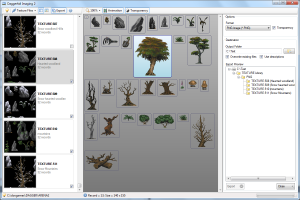 The Export Preview tree previews the folder structure created by the exporter. This structure will change based on your destination folder, chosen image library, and selected format. The goal is to keep your exports neatly organised. These settings are remembered each time you open DF Imaging 2. This tight integration should make it easy to export as many (or as few) files as you need. Everything is coming together nicely. 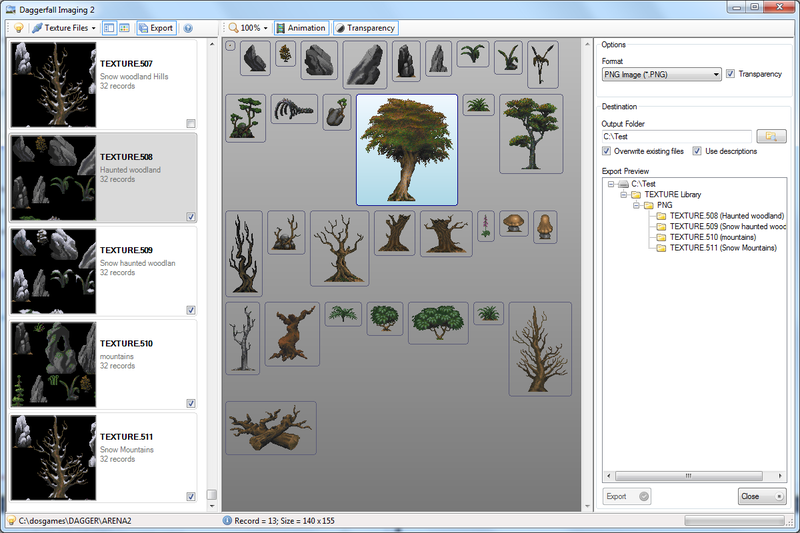 I just need to complete the new export manager and DF Imaging 2 will be ready for release. Hopefully this is something I can finish over the weekend.